First-team coach John Hughes wants Hartlepool United to use Saturday's 3-0 defeat by Doncaster as motivation for Tuesday's visit of Colchester United. Pools' seven-match unbeaten run was ended at the Keepmoat, and they remain eight points adrift of safety. "We need to take our disappointment and use it as fuel, channel it for Tuesday," Hughes told BBC Tees. "I'm sure a few of the players will say, 'I'm better than what I showed there' in terms of effort and desire." Prior to the loss in South Yorkshire, Hartlepool had begun a push up the table which lifted them off the foot of the table for the first time since October. The midweek victory at home to Crewe was a high point, with three goals and a clean sheet against a side safely installed in mid-table, but Pools failed to replicate those performance levels on Saturday. "When things aren't happening for you, you have to go to make something happen, play off the cuff and chase lost causes," Hughes added. 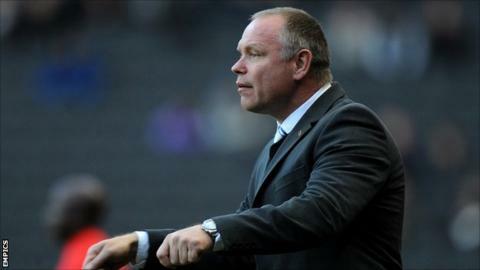 "I felt we were miles off today what we did on Tuesday [against Crewe], we set the benchmark on Tuesday. "If we want a chance to stay in the division we have to maintain those standards, no matter who we're playing."